Whenever you want to implement your application through VB6.0, Menu provides an easy way to connect another form or other activity with all controls. If you want to proceed to know about its working process, come and learn about it. Here we will discuss about 2 processes. First, Open project and find “Menu Editor” icon from Visual basic Toolbox. Remember this icon will show in enable view, when project is in design mode. First go to this option and click on it. When you click on this icon, it will show a Box with “Menu Editor” Name. For open it, you can also try to press shortcut key (Ctrl+E) from keyboard. This box contains many controls. Know something about its control as follow. Caption: Show the items Name during run time. Name: This will use to define every items name, which will use to write code with its name event. Shortcut: If you want to provide any shortcut key perform through keyboard on that particular item, then select any key option from this combo box. Note: Consider about that when you input items name in “Name” textbox, do not use ‘SPACE’ or ‘-’ or ‘,’ or ‘.’ . Use ‘_’ except this. You can add items according to requirement. It is not necessary to input same name as mention above. If you want to give any shortcut key then follow the image bellow. After doing all these process. Click on “OK” button. Now write code in its items events. Suppose we add 2 Form to Project. First name is “Form2” and second is “Form3”. 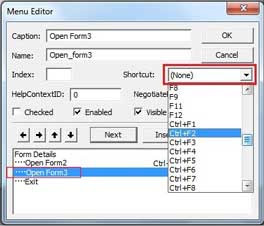 Now, write code in Item “Open_form2”. In this code we will open Form2 and change its Height, width and Background color. Now, write code in Item “Open_form3”. This code will open Form3 and also change its Height width and Background color. Now, write code in Item “F_Exit”. This code will close application. There is output of this process, which will show the main work during run time. If you want to main menu’s first character will be in underscore format such as: Form Details. You have to assign “&” operator. Before assign Caption such as: &Form Details. Note: The Underscore process will not work on sub- items. You can apply it on main item such as above describe. If you want to enable or disable process during run time, you have to write code for it. Suppose we drag 2 command buttons Command1 and Command2 with Caption “Disable” and “Enable”. Just write code in it. 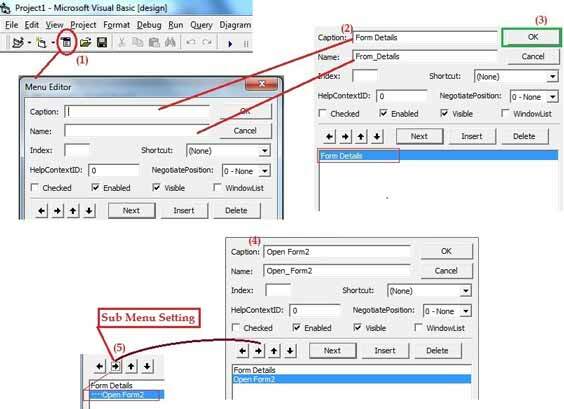 In this way you can learn about menu design and its related feature in Visual Basic 6.0 easy tips with SKOTechlearn.